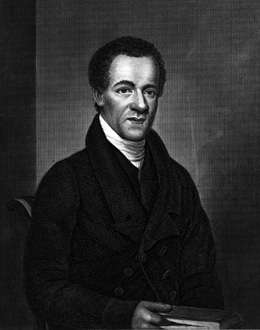 Cornish, an abolitionist and editor, was born in Sussex County, Delaware and raised in Philadelphia and New York City, New York. Since both of his parents were free African Americans Cornish was born free. After graduating from the Free African School in Philadelphia Cornish began training to become a Presbyterian minister and was ordained in 1822. Shortly afterward he moved to New York City where he organized the first black Presbyterian Church in Manhattan. In addition to his duties as pastor, Cornish also became a journalist. Working with fellow African American John B. Russwurm, he founded the first African American newspaper in the United States, Freedom’s Journal. Cornish was the senior editor of the paper while Russwurm served as junior editor. The first issue appeared in New York City on Friday, March 16, 1827. After living in a world dominated by white media, Cornish and Russwurm stated in their first editorial, “We wish to plead our own cause. Too long have others spoken for us. Too long have the public been deceived by misrepresentations, in things that concern us dearly…,” clearly showing their intentions of publishing the news without white bias against the African American news. After working on the Freedom Journal for less then a year Cornish stepped down as the senior editor and took a position as an agent for the New York Free African schools. In 1829 Cornish was forced to return as an editor after Russwurm allowed the paper to decline and shift away from its original purpose, describing the cultural and economic progress of free blacks in the North. Cornish revised the journal and renamed it The Rights of All and maintained it for a year. Cornish eventually served as editor of a third newspaper, the Colored American. He also wrote for The Colonization Scheme Considered, a publication which urged free blacks to settle in Liberia. He also helped antislavery and reform causes by helping to establish the American Anti-Slavery Society, the American Moral Reform Society, the New York City Vigilance Committee, and the American and Foreign Anti-Slavery Society. Samuel Cornish died in Brooklyn, New York on November 6, 1858. Jack Salzman, David Smith, and Cornel West, eds., Encyclopedia of African-American Culture and History (New York: Simon & Schuster Macmillan, 1996); Lerone Bennett Jr., Pioneers in Protest (Chicago: Johnson Publishing Company Inc., 1968). Johnson Publishing Company Inc., 1968).